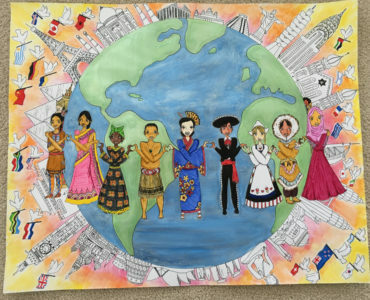 Mackenzie Alley has seen her entry in the Lions International Peace Poster Contest go global. 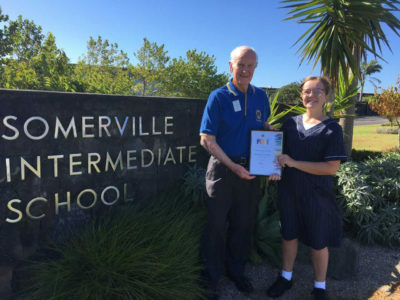 Howick Lions Club past president Ian Packwood said Mackenzie, now at secondary school, won the local Lions poster competition and then went on to win the national Lions poster competition. “Then her poster has gone to Lions’ International Headquarters,” he said. Results of the international competition are expected to be known this month. Lions Clubs International 2018 Peace Poster Competition Theme, “Kindness Matters” by Alley Mackenzie. Quotation: “If we all chose kindness, then peace will be inevitable”. The competition was for students 11 to 13 years and could be on any media and must not have lettering, just an accompanying statement. Mckenzie simply stated “Kindness Matters“. Judges from the art, media, youth development and humanitarian communities selected 24 international finalists representing the more than 350,000 youngsters who participate annually. Posters are shared globally via the Internet, social media, news outlets and travelling exhibits.